Nice ad, but where's the phone? Too much to learn in a 30-second ad? BlackBerry has spent the big bucks getting a premium ad placement during the Super Bowl in the US, but the ad it chose to play fails to capitalise on this major opportunity. is visible for just 3 seconds. 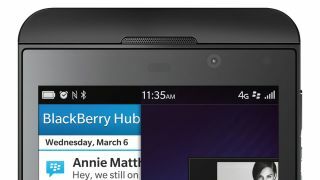 This, despite BlackBerry execs repeatedly telling press at the launch of the platform, that its biggest challenge with the new system was showing off some of the unique ideas in OS design, like the unified inbox called Hub, and explaining the new gesture-controlled user interface. BlackBerry's new Chief Marketing Officer, Frank Boulben clearly explained to us last week that the focus of BlackBerry's advertising efforts would be highlighting what makes this new system different. "We are not selling a me-too product…so you will see in all of our marketing creative that we are showcasing the key features of the product," said Boulben. Except for the insanely expensive Super Bowl ad, it seems. It's not that the BlackBerry spot falls to be engaging. But after using the new BlackBerry Z10 for several days, we just think that BlackBerry fans are going to need all the help they can get in getting their heads around the intricacies of BlackBerry 10 OS.